Starting off is BTOB and even though 'Missing you' is a sad song, this boy group keeps things upbeat. Before they even begin to sing, the boys are congratulating each other on getting number one on the music charts and fooling around. And this energy continues through their live singing with the members making the beats with their mouths and getting their whole team with staff members to stand up, clap and sing with them at the end. Roy Kim's 'Spring Spring Spring' takes on a different perspective with its acoustic version. Throughout the whole video, the room is entranced by his singing as the once loud tables quiet down to hear his heartfelt, emotional voice. A Pink 'FIVE' on 'Tipsy Live' really shows their fun and playful nature as this seems like more of a regular night in, drinking by themselves, rather than a video for the public. 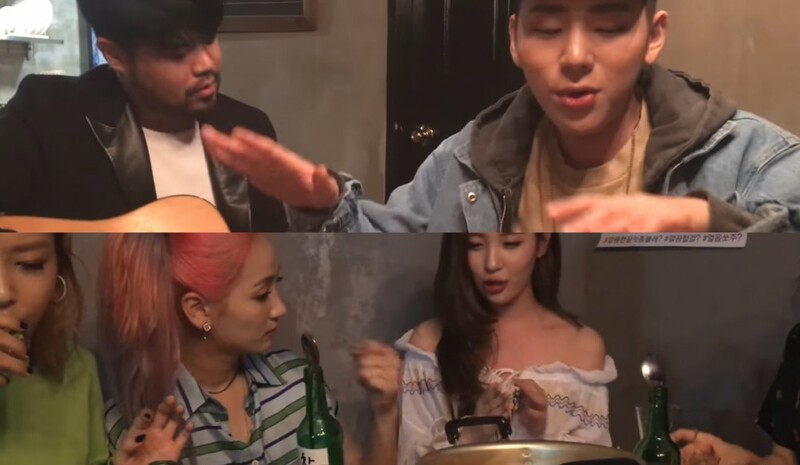 They are doing one-shots, love shots, and drinking out of the soju bottle, using corn mics, having side conversations and turn the last line of 'FIVE' into a cheer for another round of drinks. Highlight or former B2ST performed their song 'Ribbon,' and it's unreal how good they are live. Doojoon may have a little trouble keeping the beat but even that can be overlooked at how stunning their harmony is. EXID's acoustic version of HOT PINK has just as much energy as its regular version. The girls all chime in for the chorus and make sure to show off their unique vocals and powerful high notes even though they may be a bit tipsy. The members always have a smile on their face and the room is full of laughter as well as their grooving and dancing. hyokoh's 'Tipsy Live' brings both laughter and amazing music to its viewers. Lim Hyun Jae and Oh Hyuk are so serious with performing but Im Dong Gun and Lee In Woo seem to be in their own world, playing drinking games and having giggling fits together. The three non-vocal members all add to Oh Hyuk's dreamy vocals music by joining in on the chorus but that ignites laughter in all, as the members' voices are so deep and very out of tune. Man, watching this makes me miss the Wonder Girls. They're all so pretty and having a blast here. Their vocals are also WONDERful. This is what 'Tipsy Live' is truly about! Good music and good drinks with your friends. The performance by Zico here is just wonderful. He's so talented and it's on full display here. What are some of your favorite 'Tipsy Live' videos that we missed?